The Vatican has released an instruction with new norms for contemplative orders of nuns, encouraging cooperation among their monasteries and outlining procedures for communities left with only a few members. Source: Global Sisters Report. The Cor Orans (“Praying Heart”) document is a follow-up instruction on implementing Pope Francis’ 2016 document Vultum Dei Quaerere (“Seeking the Face of God”), which issued new rulings and mandates for monasteries of women around the world. The aim of both, the Vatican said, is to safeguard the identity and mission of contemplative women religious. The Pope charged the Vatican Congregation for Institutes of Consecrated Life and Societies of Apostolic Life with creating the new instruction, which seeks to fill the legislative gaps left since Pope Pius XII’s apostolic constitution Sponsa Christi, from 1950, and facilitate carrying out the mandates in Vultum Dei Quaerere. The instruction was released by the Vatican yesterday and went into effect immediately. 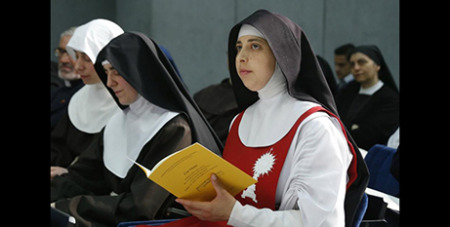 Archbishop José Rodríguez Carballo, secretary of the congregation, told reporters one of the most significant changes is requiring a monastery or contemplative community of women religious to have at least eight professed religious women in order to maintain their autonomy. If that number drops to five professed religious, they lose their right to elect a superior, the Vatican congregation is informed of the situation, and an ad hoc commission is formed to name an administrator, he said. While Sponsa Christi encouraged communities to join a federation to avoid isolation and reap the benefits of communion and sharing, almost half of all monasteries have not joined any form of association or federation, said the congregation undersecretary, Cistercian Fr Sebastiano Paciolla. Francis’ new ruling included a mandate that all monasteries are to be part of a federation with the aim of facilitating formation and meeting needs through sharing assets and exchanging members; however, a monastery can request an exception from the Vatican.